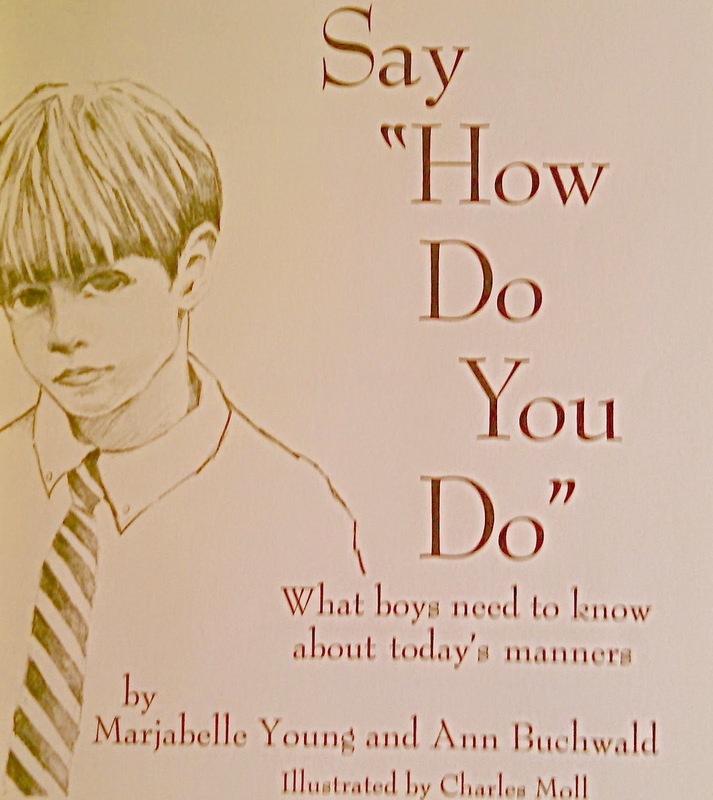 "Some Kind Thoughts" from Stand Up, Shake Hands, Say"How do you do?" 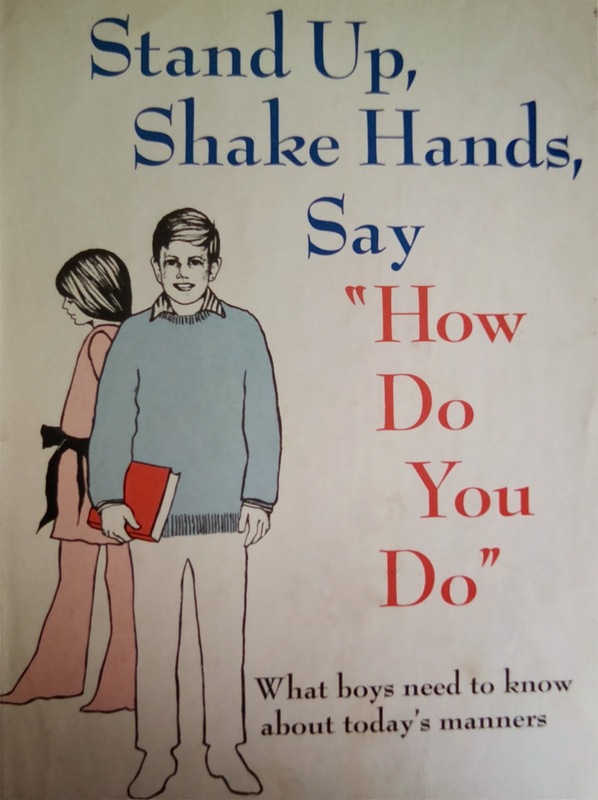 Vintage etiquette advice for teen boys. Blind people are not deaf, so you don't have to talk louder. When you're talking to a blind person, use his name as often as possible, because that is his only way of knowing you're addressing him. When you first meet a blind person, even if he knows you well, identify yourself: Say, "Hi, I'm Jim Jones." or "Hello, Mrs. Smith -- Margy Brown." And always tell a blind person what you are offering him: "Here's your sandwich, Bill." or "This is the iced tea you wanted, Mrs. Johnson." Deaf people prefer to read lips or to follow their own methods of hearing you; so don't raise your voice around them. Always keep your head turned toward a deaf person when you are speaking, although you don't have to keep your eyes focused on him. Never point out to a newcomer that someone is deaf -- it doesn't help anyone or anything. "You're off to a pal's for a while. You're going to buy some bicycle tape. It's important to let your parents know -- they relax when they're sure of what you're up to." Say good morning -- or at least "Hi" to each member of your family when you first see him in the morning. Answer when your spoken to -- Say, "Yes, mother. "; "No, mother. "; "Yes, dad. "; "No, dad." instead of Yah, Unhuh, Nope, and Naw, which are noises, not words. Say hello to your father when he comes home from work -- Just a simple, "Hi, dad" as he takes off his coat reminds him of what he's working for -- you, mostly. Let your family know when you come and go -- You're home and all's well. You're off to a pal's for a while. You're going to buy some bicycle tape. It's important to let your parents know -- they relax when they're sure of what you're up to. The more cooperative you are about your plans, the more cooperative they'll be. Replace what you borrow -- and believe it or not, others will do the same for you! Say "Sorry" when you bump into someone, step on a toe, or get in someone's way -- and that goes for young and old, male and female victims. Stand up when your mother comes into a room and offer her a chair if she's going to sit down. Hold her chair for her when she comes to the dining room table. Then you'll remember to do this for other women. Open doors for your mother and sisters -- for all women, as a matter of fact, and let them go ahead of you. 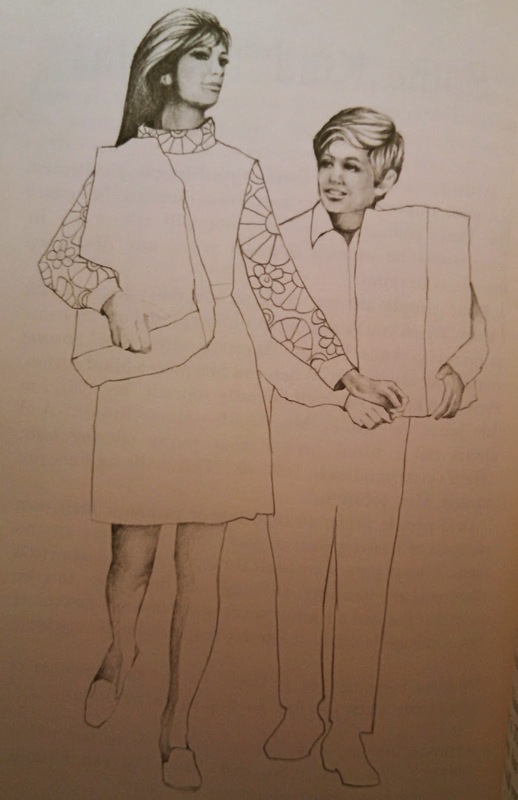 Thanks to the terrific illustrations by Charles Moll, we know just what their son would have looked like if "That Girl" and Don Hollinger had ever procreated. Carry packages for your mother or any other woman you're walking with. This includes sisters. Say "Thank you" and "Please" when you ask for something or get it. These may have been your first words of good manners, but no matter how tall in the saddle you get, they're still your most powerful weapons. Pay your debts, even if it's only a dime you owe your little sister. It's the only way to avoid becoming a dead beat, a beggar, or a bad risk. If you're broke, offer to do an errand or a chore; then pay what you owe on the spot. Observe others' privacy -- and you'll get the privacy you want for your own room, possessions, mail, books, or collections. When you share a room, do your share of housekeeping -- particularly in the bathroom. Hang up towels, put your own stuff where it belongs, and clean the bathtub before you leave. Say goodnight to your parents when you're ready to go to bed. You don't believe in ghosts anymore, so why disappear like one yourself?